These stylish apartments are located on different location in the Sagrada Familia area, within 200 metres away from Sagrada Família Church. Each air-conditioned apartment includes free Wi-Fi and a modern kitchen with a washing machine. BarcelonaForRent Sagrada Familia Apartments have lift access and include air conditioning and parquet floors. Apartments have a living-dining room with a sofa bed and TV. Kitchens include an oven, electric hob, coffee maker and dishwasher. Bed linen and towels are provided. The apartments are situated in a quiet residential area with plenty of supermarkets and local bars nearby. Just 400 metres away, Gaudi Avenue offers various popular restaurants and pavement cafés. Sagrada Familia Metro Station is a 2-minute walk away, and is just 3 stops from Passeig de Gracia Station and the city centre. 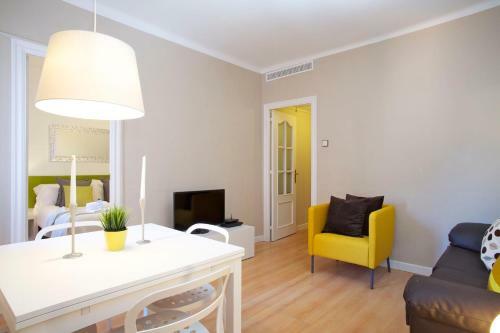 Check-in takes place at BarcelonaForRent Apartments’ main office, located at Calle Bailen 120, 08009 Barcelona and opens from 12:00 until 23:00, 7 days a week. If you expect to arrive outside reception opening hours, please inform BarcelonaForRent Sagrada Familia Apartments in advance. Please note check-in during the following times incurs the following charges: After 22:30 - € 30. Between 01:00 and 02:00: € 50. Check-in is not possible after 02:00. Address: Corsega, 515-515 Bis This stylish air-conditioned apartment has a balcony, a living-dining area with a TV and a bathroom with a shower. The modern kitchen includes an oven, electric hob, coffee maker, dishwasher and washing machine. Free Wi-Fi is also provided. Address: Rosselló. 446 This studio offers free WiFi and air conditioning. It has a sleeping area with 2 single beds and another area with 1 single bed. There is a living-dining area with a TV, DVD player and a double sofa bed. Pets are not accepted. Address: Calle Roger de Flor, 241 This air-conditioned apartment has a balcony, a living-dining area with a TV and a bathroom with a shower. The modern kitchen includes an oven, electric hob and washing machine. Free Wi-Fi is also provided.